For environmental control of your household water supply, the American Eagle Water Systems soar above the competition. Exclusively designed for Radiant Water, they owe their reliability to high quality components and solid construction. • A compact Black or Almond fiberglass filament center tank, which surrounds a heavy plastic blow-molded inner tank. 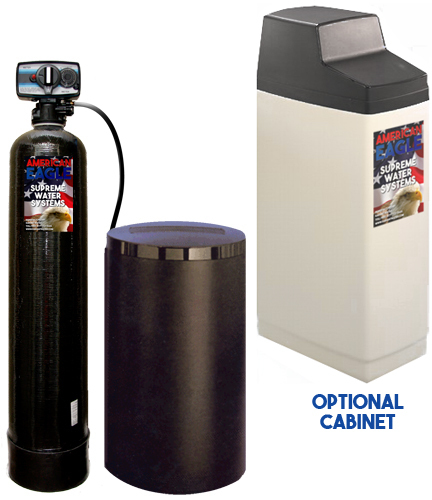 The Tank & Brine tank are also available in an all-in-one space saving cabinet. • Reliable, time-tested electro-mechanical meters last for decades, monitoring capacity so the water system regenerates only when necessary. • An automatic reserve means you never run out of quality filtered and softened water throughout your home. Most home water conditioners use only a sceond-stage softening mineral in their filtration process, but Radiant Water sets its standards higher. American Eagle Econo Water systems has a 3-stage filtration system. Softening mineral filters water and removes iron. High grade silica removes cloudiness, "polishing" water to sparkling clarity. Quartz filter provides you with clear, delicious tasting water every time you turn on the tap.